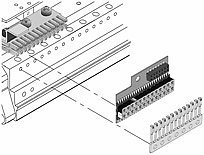 Looking for Tally T6212, T6215 & T6218 Parts? The T6212, T6215 and T6218 Line matrix printers are ground-breaking solutions for high-volume, mission-critical impact printing. Tally combines cutting-edge innovation with time-tested technology to make the T6212, T6215 and T6218 superior in speed, reliability, and quality. At 1200, 1500 and 1800 lines per minute (LPM) respectively, they actually outperform line printers rated at higher speeds when printing in "real world" applications. Outstanding throughput is made possible by technological advancements to the hammer bank and paper feed system. As price/performance leaders, the T6212, T6215 and T6218 cost less to buy, less to service and less to use while setting new milestones in connectivity and functionality. The patented Smart Ribbon 250 offers clean-hands ribbon cartridge convenience while delivering new ribbon quality over its entire 250 million character life-the longest life in the industry. With the widest range of printer emulations, impressive network printer management, popular graphics languages and top-notch web administration utilities, the T6212, T6215 and T6218 can take on the challenge of line printers in any class, and win. Every time. Remarkable ECMA Spreadsheet throughput speeds over 44 pages per minute! Ergonomically enhanced control panel and reversible doors for operator convenience. Physical (H x W x D) 40" x 28.2" x 28.3"
All LANPlex-equipped Tally printers are supplied with Tally Printer Management, a powerful set of features to facilitate setup and operation of Tally's network capable printers. Tally's exclusive Read/Right bar codes incorporate an innovative new printing algorithm which greatly improves bar code readability without sacrificing throughput. To measure the speed performance of impact printers objectively, the European Community Manufacturer's Association (ECMA) adopted standards for testing print speed, and ECMA is the internationally accepted benchmark test. We expected the T6212, T6215 and T6218 to be fast, but the results of standardized ECMA testing exceeded all expectation. The chart below depicts the throughput (pages per hour) of the standard ECMA tests.